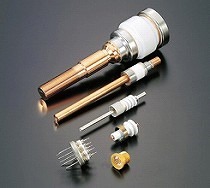 Taking advantage of the superior electrical insulation and mechanical strength properties of Alumina Ceramic, NTK manufactures a variety of terminal products such as terminal connector boards and ceramic feed-through. Edge and external surface of the product are metalized , then brazed with the central axis(copper) and terminal block via kovar or 42 alloys. Since it has high electric insulation properties, it can be used under a high current and high voltage.